Open the document that you want to send. Print to the Print2Email printer driver as you would to any other printer. 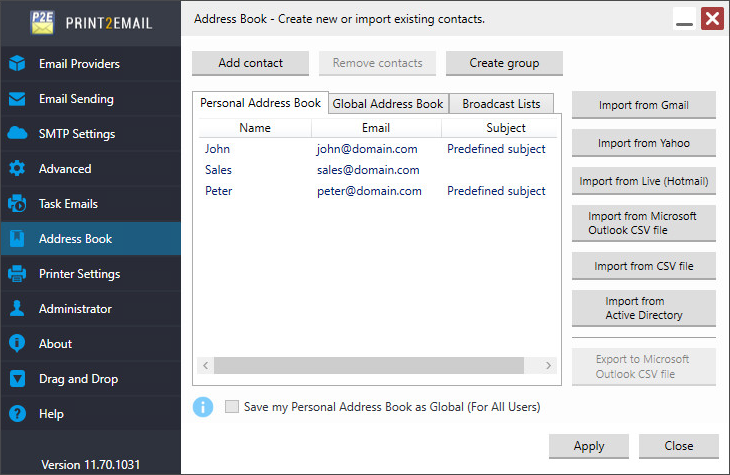 By default your Outlook or Exchange Address book will be launched and you can select the recipient. Once the recipient has been selected, the e-mail form will open and the document will be automatically converted to the selected file type and added as an attachment. Click on Send and the email is on the way. 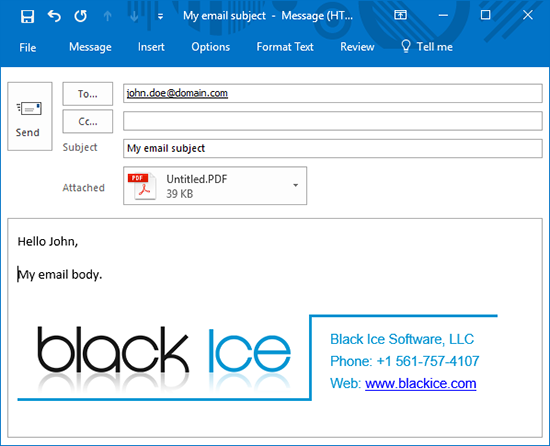 Print2Email utilizes Black Ice Software's latest printer driver technology for increased reliability and security. 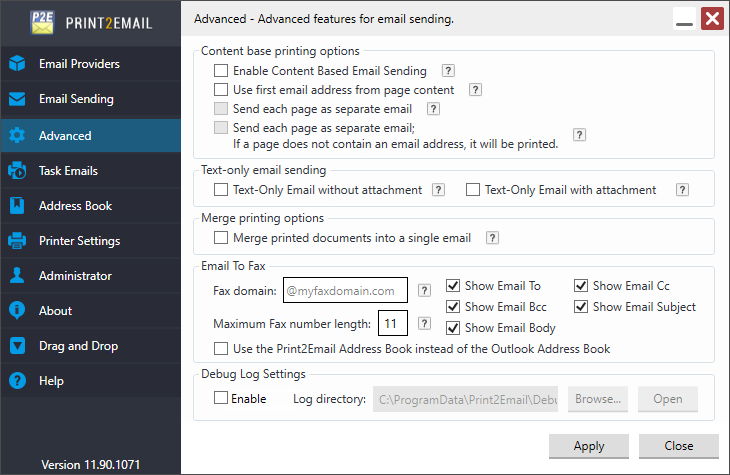 Print2Email is fully configurable with many options. Print2Email can be set to send every document to the same e-mail address or a new recipient can be chosen each time. The file format can be specified from PDF, JPEG, TIFF monochrome, 8 bit or 24 bit color and more. New fully customizable MSI installers are available designed for large scale deployment in Active Directory environments. For MSI Installer availability, contact sales@blackice.com. Contact Groups for sending emails to large number of recipients. 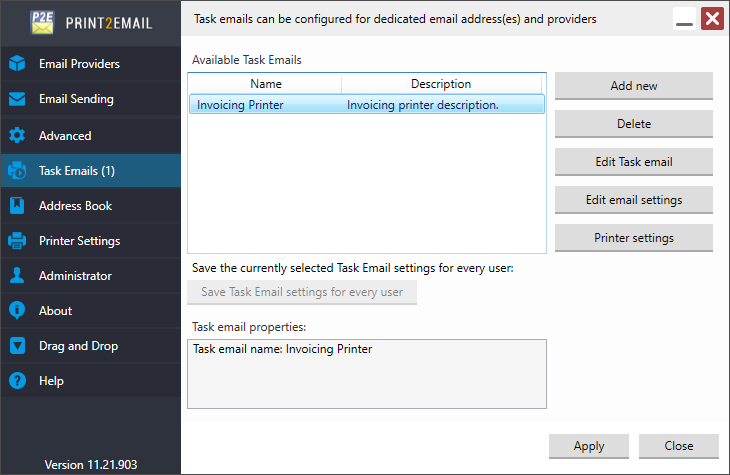 Administrator features to setup Print2Email for all users with one single click! 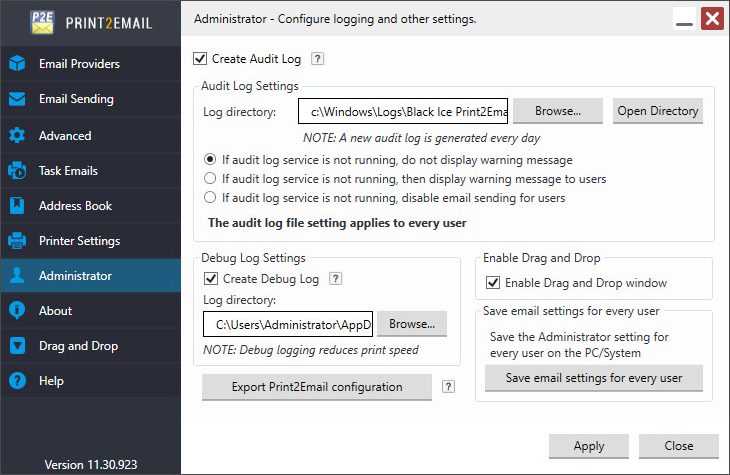 Audit Logging let Administrators to monitor the outgoing emails sent by Print2Email. POS (Point of Sale) features to let users predefine the Email Subject and Email body, but prompt the user to enter the recipients email each time. Built in security! The document you send cannot be changed by the receiver or any third party. What you send is what they get! 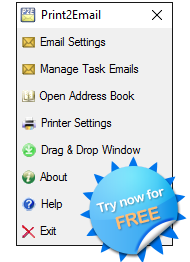 Easy To Use!Print2Email Server has a simple easy to use User Interface. Simply open your document and print the document to the Print2Email Server printer driver the same way you print to “regular" printers. Next, select the recipient(s) you want to send the document to and you are ready to go. Print2Email includes Content Base Email Sending feature to extract specific information from the printed documents, (for example email subject) and Print2Email will send the email based on the extracted information. The following parameters of the email sending can be specified with Content Base Email Sending Feature; Recipient(s), Carbon Copy (CC), Blink Carbon Copy (BCC), Email Subject, Email Body, External file as additional attachment, Password protection for the attached PDF document to open or edit the PDF. 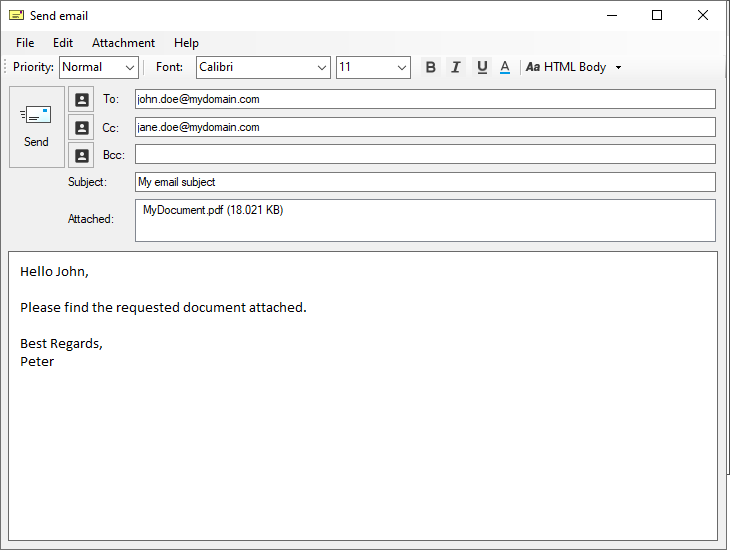 Recipients can open, save and store the attached document images just like any other attachment. If you do not have an image viewer you can download the Free TIFF Viewer and Internet Browser plug-in. The TIFF Viewer and Internet Browser Plug-in allows you to open TIFF and JPEG files created from any application - including Print2Email. A full blown version of the TIFF Viewer is also available online through our electronic distributor. Fully customizable MSI installer is available for IT managers for large scale deployment. Convert and Send any printable document, receipt, invoice and more. Print2Email Server is licensed per Server. One license is good for one terminal server. Print2Email Server can be used by unlimited users on the terminal server. Black Ice Software offer different licensing models for corporate users and End Users. For more information, please visit the What license do I need? page. For individual desktops, please see the Print2Email for Windows 10/8/7/Vista/XP pricing. Print2Email comes with a new ability to utilize the Signatures from Outlook, or from other MAPI Compatible clients. Using the new signature feature, one can setup a signature to be used every time when sending a document via email. 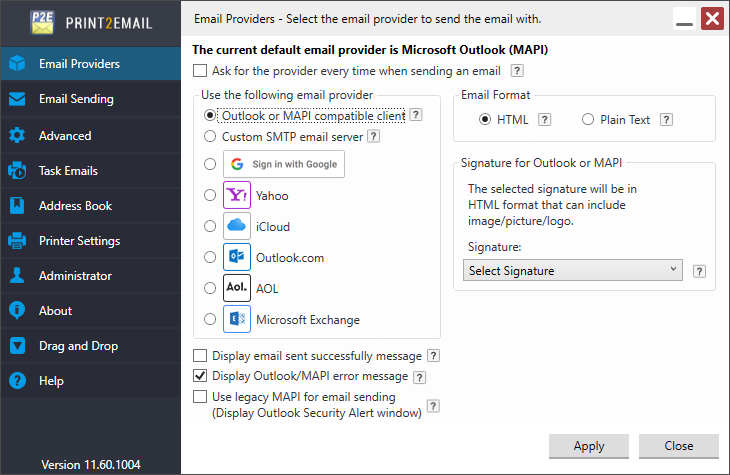 The signatures will be substituted directly from Outlook or from other MAPI compatible clients. As a result, the signature will be displayed exactly as it was formatted in Outlook, allowing users to take advantage of the Outlook's user-friendly interface to create a customized signature for the emails. 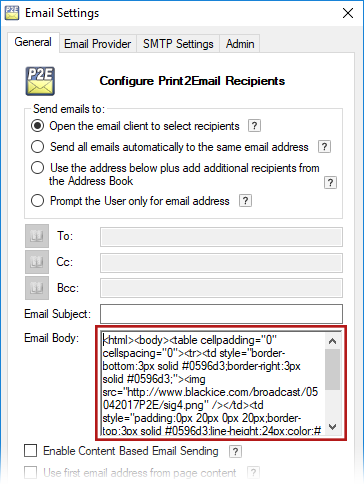 In the new Print2Email, the predefined signatures are listed in the Print2Email Email Settings, under Email Provider tab, at the Signature dropdown list. In order to use one signature in the outgoing emails, select the appropriate signature from the dropdown list, and press OK to save the changes. If you do not see any signature in the dropdown list, please make sure that the signature is added in Microsoft Outlook. From now on, the selected signature will be added to the bottom of every outgoing email from Print2Email. The Print2Email is able to read standard HTML code in the email body, allowing users to easily configure professional customized HTML signatures in Print2Email, to be used every time when sending a document in email. Users can write their own customized HTML signature, or they can select one of the following templates, and replaced the name and logo. Once the HTML is done, one can set it up in Print2Email. To add a customized HTML signature to the email body, add the HTML code to the Email body in Print2Email's Email Settings. Once the HTML signature is added, Print2Email will use it in the email body every time when sending a document in email. In the Email sending, simply write the email body above the Signature, or above the HTML code, and send the email. 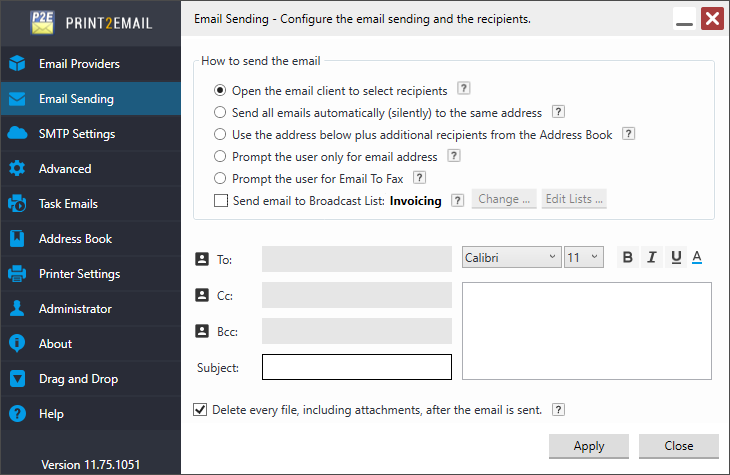 Also, in order to use HTML email sending with the Outlook client, please select Outlook or MAPI compatible client email provider, and uncheck the Display Outlook Security Alert Window checkbox. 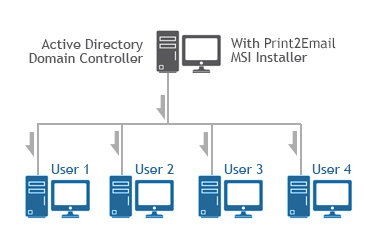 The MSI installer for Print2Email designed for large scale deployment in Active Directory environments. With the Print2Email installer System Administrators can create custom configurations for every User on the system and register or activate the Print2Email. The MSI installer will greatly simplify mess deployment and eliminates the need for customers to build custom installations. The MSI installer is compatible with Microsoft SMS/SCCM, Zenworks, and Marimba. Install the Print2Email Server for evaluation. Configure the connection to license server with proxy server. Pre-configure the Print2Email Server using the configuration ini file. Such as file format, output directory, and more. Every feature of the Print2Email Server can be pre-configured. Hide Print2Email Server Printing Preferences Tab(s) from Users. Configure the Print2Email Server settings for large scale deployments. Such as email settings, recipients, and more. Every feature of the Print2Email Server can be pre-configured. Configure Email fields of To:, CC:, BCC:. Please contact sales for more technical details on the MSI installer at sales@blackice.com. For MSI Installer availability, contact sales@blackice.com.